A few days ago one of my friends from undergrad came back to campus to visit. He was recruiting for his current company, and took out my boyfriend and I (the three of us were best buds in college) for some upscale sushi on his company's tab. I had heard some great things about Fugakyu from friends, and it was accessible from the T, so off we went. I have to say that my only prior experience with store-made sushi is Shino Express Sushi on Newbury St. in Boston, which is known for having the best bang for your buck authentic sushi. It is delicious and cheap, the only drawback being that it is a hole in the wall and lacks the variety that bigger sushi restaurants have. Fugakyu on the other hand, had an incredible extensive menu that had my head spinning, and each roll cost two to three times what it would have cost at Shino's. But I did discover that at Fugakyu, you get what you pay for (which is a lot), and you pay for what you get (which is very good sushi). We arrived at Fugakyu on a Thursday night at around 8pm, and the wait for a table was 30 minutes, which I have since learned is the norm. 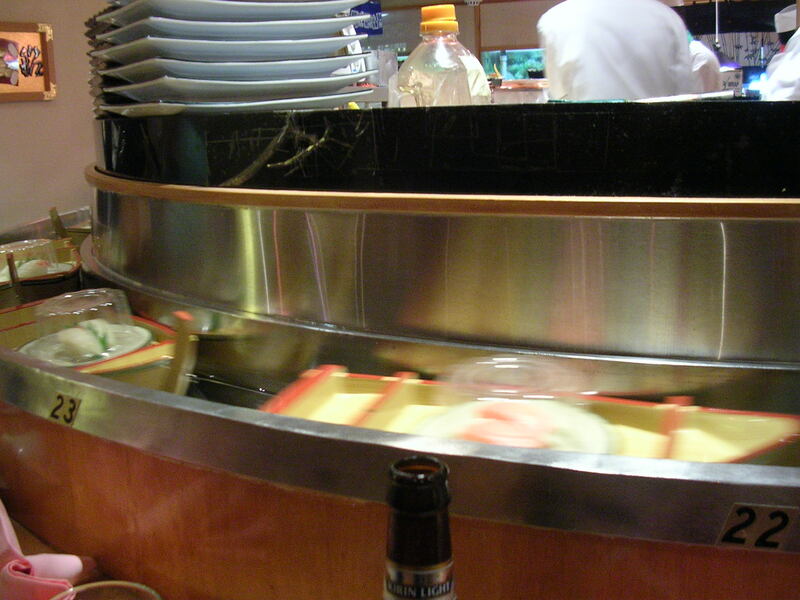 I eyed a sushi bar in the main room, with a kaiten sushi setup (the sushi phenomenon of having various plates of sushi move by on a conveyor belt and you can just take whatever you want), and so we asked to be seated there which was without any wait. Awesome idea! We sat down and floating past us on a little moat were boats with plates of sushi on them, pushed along by a current of water underneath. It was really quite exciting for us. I have to apologize for not getting better pictures of such a neat looking setup, but these boats they just keep moving along so there is no way I could have gotten a picture that wasn't blurry. But you get the general idea from this picture. So the funny thing is, the three of us kept staring at the sushi, thinking about which plates we might want to pick up and eat, when we started to notice that some of them looked really plastic. But we kept arguing amongst one another about whether some of the sushi were fake placeholders or not, because other pieces looked quite real. In the end, we figured out that the entire setup was fake, because Fugakyu only serves Kaiten sushi on Mondays and Tuesday nights! Haha oops! I'm glad we didn't reach out to take any of the plates. I'd really like to go back sometime and try the Kaiten sushi though, it's only $4 a plate regardless of what's on it, so it really takes the guesswork out of choosing. We each ordered 3 kinds of sushi. I ordered a lobster maki (which had lobster, asparagus, avocado, cucumber, lettuce, tobikko, and spicy mayo), a Fugakyu maki (tuna, eel, fried sweet potato, scallion, and bonito flakes), and a negi chu-toro maki (fatty tuna with scallions). My boyfriend and Tony ordered spider maki, negi toro maki, spicy snow crab maki, toro nigiri, fried snow crab maki, and salmon roll. 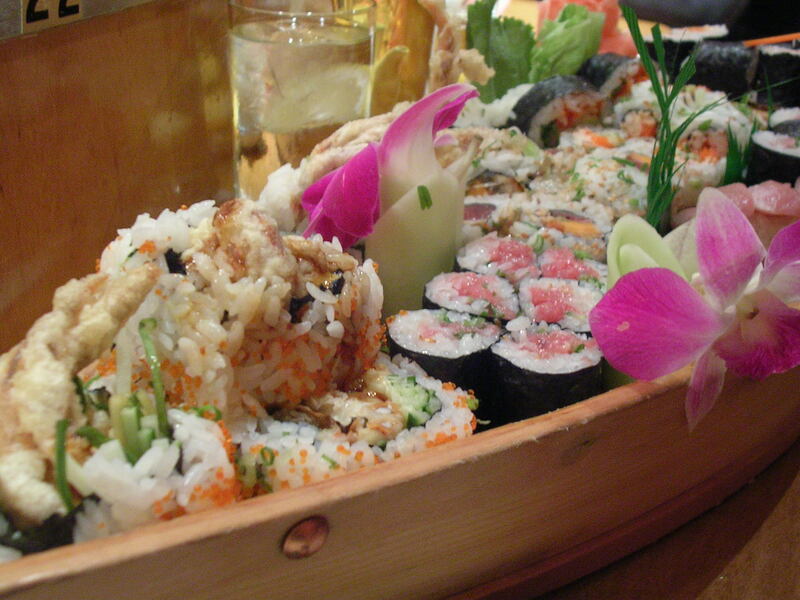 The sushi came all together on a huge boat, it was such a beautiful and mouth-watering sight! At the upper right is my lobster maki with its bright orange tobikko (flying fish roe). The lower right is my negi chu-toro maki. And at the left is my Fugakyu maki with the tuna and fried sweet potato most visible. They were all incredibly delicious and melted in my mouth. The lobster roll was fresh and had a lot of crunch from the medley of vegetables. The lobster meat was cooked just right, it was tender and amazingly sweet as good seafood should taste like. Just absolutely fantastic, aside from the fact that the pieces were so big that they always fell apart after I bit into them. 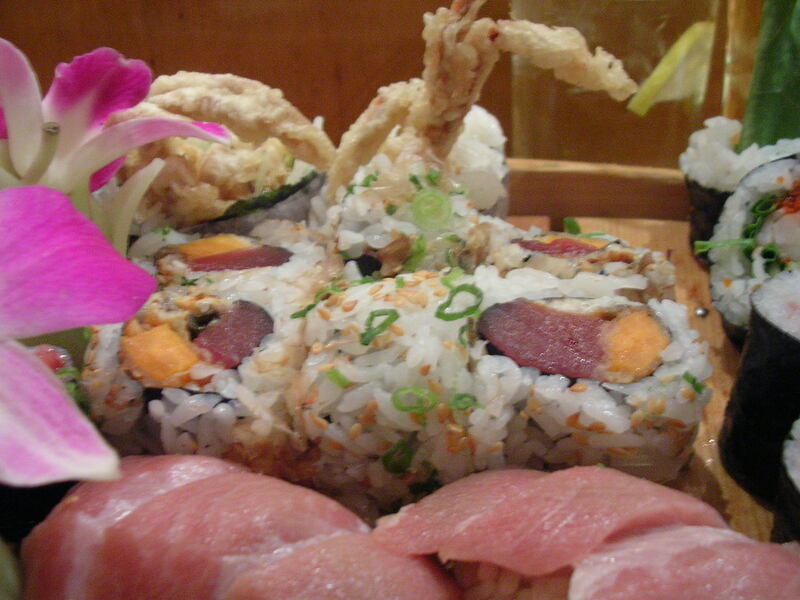 The negi chu-toro maki was a luxurious roll to eat. Chu-toro is a type of fatty tuna that is on the low end of the fatty tuna spectrum. I chose it because it was cheaper than the higher grade "toro" offering, but I honestly thought it tasted incredible. It was smooth and creamy, and paired well with the scallions in the roll. I have had a negi toro roll from Shino's, but I definitely thought that the one at Fugakyu was better. It was not ground up fatty tuna but rather in one piece. So delicious. Finally my Fugakyu maki with its tuna, eel, fried sweet potato, scallions, and bonito shavings. The fried sweet potato is an ingenious idea for a sushi filling. It had crunch, it had sweetness, and it went perfectly with the mildness of the tuna and the sweetness of the eel. My only complaint was the bonito shavings, which I wasn't that fond of. They were a little bit fishy, as they should be, which I thought did not add to the roll. Still, the flavor from the other fillings was so bright that the bonito wasn't a problem at all. There was so much stuffed into this roll that it was a flavor explosion in my mouth with eat bite. I loved it. This shot has some of my boyfriend's rolls in it: the spider maki (fried soft-shelled crab tempura, cucumber, avocado, spicy mayo, tobikko, scallions, spicy eel sauce) which was the envy of all of us because the pieces were huge and looked absolutely delectable. He said it was the best out of all his rolls. You can also see his negi toro maki, which is the higher grade fatty tuna roll that I didn't get, though it looks pretty similar. His snow crab maki is in the previous picture at the very top left next to my lobster roll. Tony's sushi is in the picture above, with the exception that my Fugakyu roll is in the middle. His fried snow crab roll (kani katsu maki) is at the top, with fried snow crab, cucumbers, spicy katsu sauce, and scallions. His toro nigiri (which cost $15 for 2 pieces) is at the very bottom. He said they were really good, though not as good as the even more upscale Oishii restaurant which most people agree has even fresher and better fish than Fugakyu. Still, it was pretty deluxe I imagine. 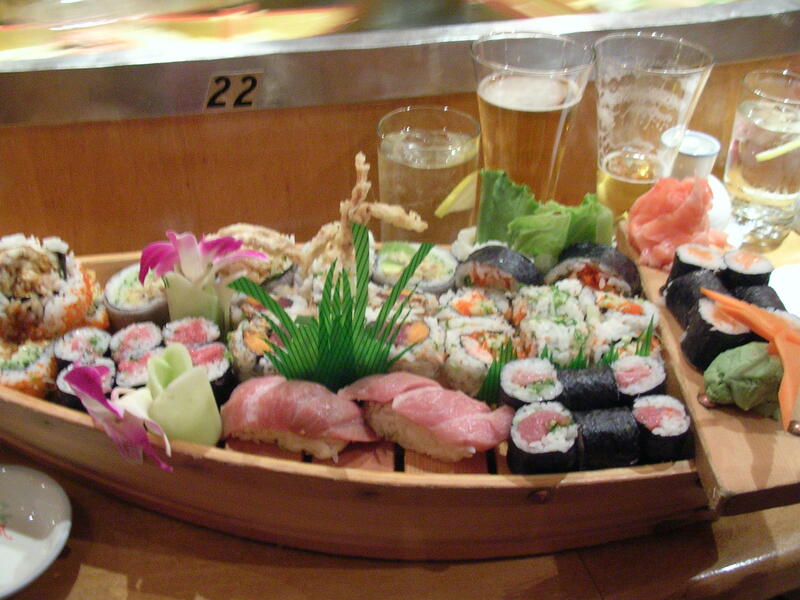 His salmon roll wasn't too exciting to look at so there's no picture of that except in the first sushi boat picture. 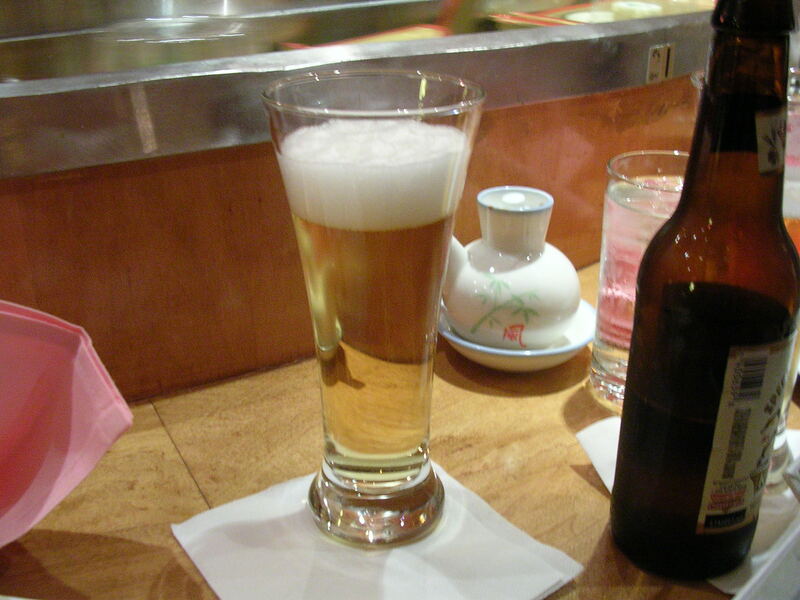 This entry was posted on Monday, September 24th, 2007 at 12:00 am	and posted in Japanese, restaurant, Uncategorized. You can follow any responses to this entry through the RSS 2.0 feed. Ahhh Fugakyu. I love that place. 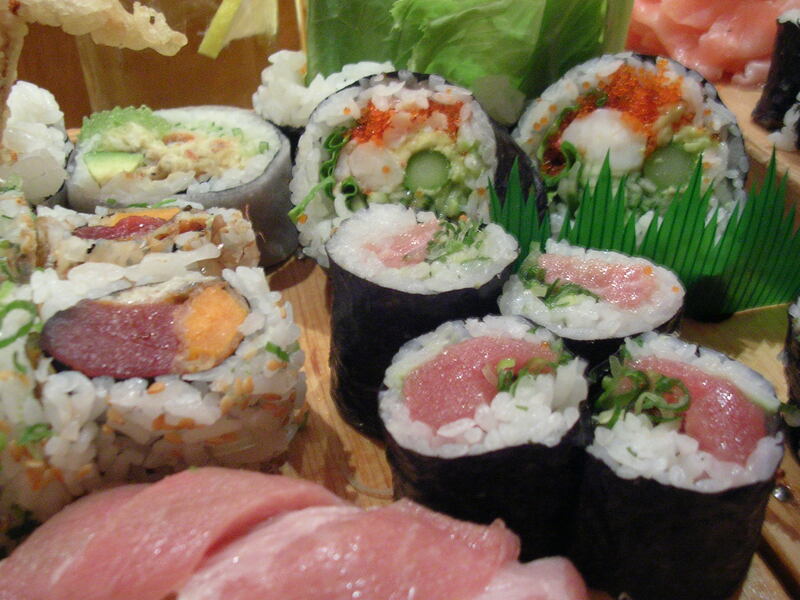 For good sushi a bit cheaper check out Oiishi in Chestnut Hill and Toraya in Arlington. Sakura in Newton Highlands is pretty good too.